There’s been a growing trend of Shakespeare related books of late. Leading up his 450th birthday, authors scrambled to publish books in order to catch the wave of Bardolatry. We saw books about the man, his life, and his work. Some books were more successful than others. There was more interest in The Science of Shakespeare than there was for Shakespeare Star Wars, yet both tested critic’s views on what they were willing to accept. The trend continues. It appears ever few months a new book is published that promises to shed new light on Shakespeare’s life or work. The authors of these books are convinced they know something others do not. While it is true, research in any field can offer new clues about a given subject, we have to be careful in assuming the connections we make between our chosen subject and what we have found are true. As I have said in past posts, it is a grave mistake to assume the connection(s) we find are evidence of some truth about Shakespeare. There is no shame in asking, “could it be?” but to say we KNOW is narcissistic speculation at best. Tina Packer’s “Women of Will”, based a play of the same name, could have and should have been a delightful read. Packer is a director and actor who has dedicated the last 30 years to Shakespeare. Her knowledge of the theater alone would be reason enough to write a book. Yet she too falls into the “I know” trap as she talks about Shakespeare’s thoughts on women and why we wrote them as he did. Worse yet, she makes some rather bold claims about his life, as if her gut feeling is as good as factual knowledge. She claims to know who the Dark Lady is and her ‘relationship” to Shakespeare. Her claim that Shakespeare wrote Henry VI while still in school is laughable. Packer may be a brilliant director but it is fair to say that she has allowed herself to get too close to her subject. Make no mistake, Packer offers her readers insight into the world of acting, but an academic she is not. This is why Shakespeare’s London is such a breath of fresh air. Hannah Crawforth, Sarah Dustagheer and Jennifer Young, three UK college lecturers, take us on a tour of Shakespeare’s world without a hint of “I know”. The authors point out events and social situations that might have been the inspiration for some of the plays. They make connections but never assumptions. Ironically, had they done so, I would’ve had to reassess my critical view on this sort of research. What they offer is compelling. Each chapter is a specific view on London’s society. The first chapter is on violence, the last on economics. Every chapter opens our eyes to a new part of London society. They show us what Shakespeare would have seen and experienced. They offer tantalizing clues about Shakespeare’s world and how he may have mirrored it in his plays. Chapter one talks about Tyburn, the city’s site for public execution. Travelers to London in Shakespeare’s day would have been greeted with the horrific sight of bodies left hanging. London’s citizens viewed public executions as part of everyday life. Hundreds stood and stared as criminals were hanged, drawn, and quartered. These same people would think nothing of watching bear baiting and dog fighting. We don’t know if this type of spectacle was shocking to young Shakespeare but it is interesting to find out that in May of 1593 two Puritans were taken to Tyburn to be hanged. At the last minute they were reprieved, only to be taken back to prison, and hanged a week later. Shakespeare would write Titus Andronicus not long after this event. There is a scene in which it is noted that the hangman had taken someone down, “for the man must not be hanged till the next week”. This is a very bloody play that suggests that nothing good comes from senseless violence. While we will never know why Shakespeare wrote this play, it is interesting to see how violence in the justice system and public sport could affect a writer. Learning about Tyburn and the city’s propensity to violence as a social norm was one of city’s many layers I uncovered while reading this book. 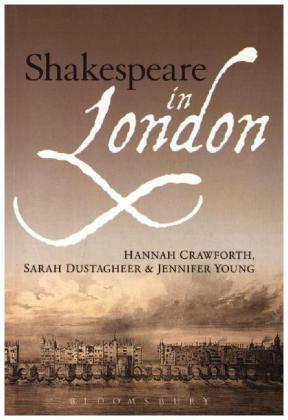 To be sure this is a book about Shakespeare’s London, but it is the city, not that playwright that takes center stage. One of the most compelling connections between Shakespeare’s work and his adopted city is the timing of The Merchant of Venice. The play was published in 1600. We don’t know how long Shakespeare took to write his plays, but even if we back it up to say, 1599, it comes close to a time in the Lord Chamberlain lives when they were struggling to find a permanent home. For a short while the players were forced to enter into an agreement with the owner of the Swan Theater, Francis Langley. He demanded the players stage no plays at any other venue; if they did they would be fined 100 pounds. Talk about demanding a pound of flesh! 100 pounds was a huge amount of money back then. Now all of this is speculation of course, and the authors are quick to point out that while we don’t know exactly what inspired Shakespeare’s writings, we do know that we are all products of our environment. This tour of London offers readers the chance to see what kind of environment Shakespeare lived in. Take from it what you will.